Have you ever heard of “Period Poverty” because it’s a real and serious issue that women and girls are facing not only all over the world and right here in New Zealand. There are thousands of women and girls having to miss out on education opportunities, school and work just because they aren’t able to afford sanitary items. It is just so wrong on so many levels so when Countdown told me about their new price drop on their own brand sanitary items of course I wanted to jump on board and help raise awareness! I personally know how much of an issue this is because I myself have spent times wondering how I was going to stretch the grocery budget. When Hubby was working in the Police Force and he was earning a “decent” wage but we had debt, we also had two new babies to look after and when you become a new parent you know it’s not cheap! We were struggling on one wage it was hard, we lived week to week and I myself used the Homebrand pads and tampons as those were what we could afford at the time. What I don’t know is the feeling of actually not being able to afford sanitary items and I want to help stop women here in New Zealand from being in that situation! Looking back now buying pads and tampons came down to being a luxury item for me so I get it! I am so grateful that Homebrand was an option for me, it was affordable and just as good in quality as the other brands. Now thanks to Countdown they have an even bigger range at even more affordable prices with their price drops and price lock down with customers expecting to save over 750k per year. 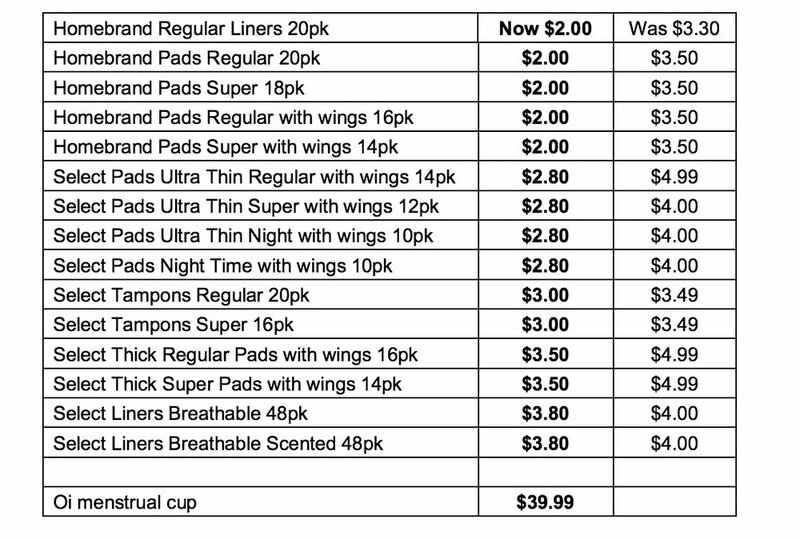 There will also be Menstrual Cups available for purchase at selected Countdown stores across New Zealand and I am all about it! No one should have to worry about not being able to afford these items because they are not “LUXURY” items they are a “NECESSITY”! This is actually something I have talked about before and something that I feel really passionate about. They were so many people sharing their stories and not just women but men also coming together in support that something had to be done about it and I am so glad its Countdown who is a brand we love and have been working with for a long time now. There has always been a certain stigma and shame on periods which is pretty crazy when you think about it because pretty much every female I know has had one and all our little girls will most likely have a menstrual cycle throughout their life time too! I love that Countdown are driven to make essentials more affordable for New Zealand women, and to make critical sanitary protection as accessible as possible. I love love love it! I know that with this massive change they will be able to help so many women and girls not only to be able to afford these items but to take part in all the opportunities presented to them as they should! If you are wanting to help you can donate Sanitary items at Countdown after your shop. They have a big purple “Food for Good” Bins in conjunction with The Salvation Army and that way you know they are going to women and girls who are directly in need. Since 2016 there have been over $190,000 worth of sanitary items donated. Thank you for taking the time to read this blog as it is such an important issue and thank you to Countdown for sponsoring this Blog and helping to make a difference. “Here’s to strong women, may we raise them, may we be them, may we know them”.